One of the major points of this chapter is that energy can take many different forms. Everyday we encounter situations in which one form of energy is being transformed into another form of energy. Consider this sequence of energy transformations. Energy arrives on Earth in the form of sunlight. This light energy is converted to heat energy as it warms up water. The heat causes evaporation and the water is lifted up into the atmosphere. When the water is lifted into the air it gains potential gravitational energy. When it comes down, that energy is converted to kinetic energy of billions of individual raindrops. Those raindrops may join the river that flows over Niagara Falls. Some of the kinetic energy of the water falling over the falls is converted to electrical energy in huge generators. The electrical energy produced by the generators power the lights (giving off light and heat energy) some newlyweds use to see and eat their dinner. 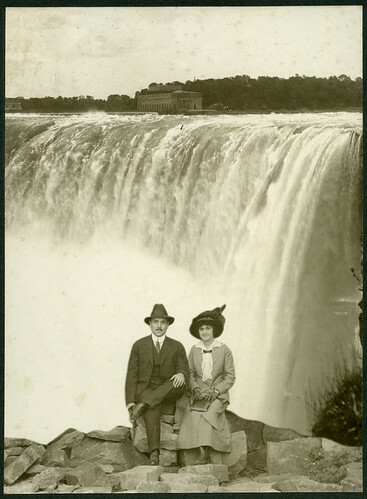 As the newlyweds admire the falls during their honeymoon they are busy converting potential chemical energy from food from their dinner into thoughts (chemical energy), physical movement (kinetic energy), and body warmth (heat energy). For each transformation, write down what form of energy it is and what form of energy it becomes. 1. A skateboarder rolls down a hill. 2. A car fills up at a gas station and drives across country. 3. An electric guitarist plays a D-flat minor chord at a rock concert. 4. A group of people go to the top of the Empire State Building in an elevator. 5. A girl throws a paper airplane. 6. A kettle of water boils and whistles on a gas stove. 7. A hydrogen bomb explodes. 8. A fan runs on batteries. 9. A flashlight shines down a dark tunnel. 10. A building is demolished with carefully placed sticks of dynamite. Try making up a few of your own energy transformation “action sentences” and challenge your fellow students to identify which form of energy changes into which other form of energy.